The Web Designer can also use the attribute of BGCOLOR= in a Table to change the background color. Sometimes, however, you can see the breaks where the Table Data Cells <TD> were. To avoid this the Web Designer just adds the attribute of CELLSPACING=0 to the Table tag. All the HTML Tags that you've learned can be placed inside a Table Data Cell. You can place links, images, lists, and use bold, center, and italics. 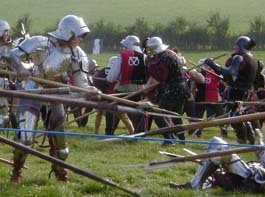 In addition Tables can be nested. In other words you can have a Table within a Table Data Cell. Everyone always asks how they can place an image in the center of the page with text on either side. Now do you begin to get an idea of the power of a Table to the Web Designer? I usually have my students study hard. But sometimes I have them make <I>strange</I> things. <BR><FONT COLOR="#666666"><B><CENTER> It will stand upright! Making a 1 meter high kangaroo, that has to stand upright, out of old newspapers and tape <strong>isn't</strong> as easy as it looks! I usually have my students study hard. But sometimes I have them make strange things. It will stand upright! 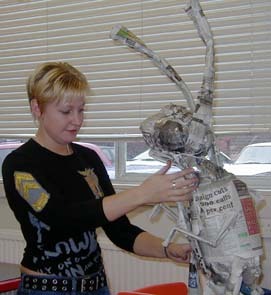 Making a 1 meter high kangaroo, that has to stand upright, out of old newspapers and tape isn't as easy as it looks! I can also make them fight for grades!